NEWARK, Del. 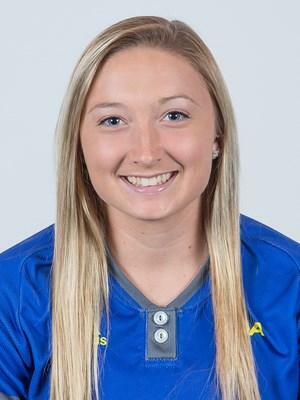 – Delaware dropped the opener, 6-0, before responding with an emphatic 11-6 victory in the nightcap as the Blue Hens split a CAA doubleheader with Towson on a sunny Saturday afternoon at the UD Softball Stadium. The Tigers (15-19, 2-6 CAA) scored the only run they would need in the opener during the top of the first on an RBI double by Nicole Stockinger, before adding two runs in the top of the third to make it a 3-0 game. Breanna McDowell delivered an RBI single in the top of the sixth, before Julia Smith-Harrington belted a two-run homer in the seventh to cap the scoring. Sara Johnson fired a two-hit shutout for Towson, with Halle Kisamore and Hanna Garber recording the Blue Hen hits. The Tigers again struck first in the nightcap with two runs in the top of the second, but Delaware (16-19, 3-5 CAA) responded by scoring the game’s next nine runs. Julia Solderitch singled home Karolina Flores in the bottom of the second, before the Blue Hens scored six runs on just one hit the following frame. Flores worked a bases loaded walk to start the rally, while Chayanna Gallardo then reached on a throwing error allowing all three runners to cross the plate. Following a pitching change Gallardo scored on a wild pitch, while Garber capped the inning with an RBI triple. Garber then doubled home Flores and Solderitch in the bottom of the fifth, increasing Delaware’s advantage to 9-2. The Tigers got two runs back in the top of the sixth, before the Blue Hens answered in the bottom half with RBI singles by Halle Kisamore and Reyna de Jesus to increase the margin back to seven. Towson again scored twice in the top of the seventh and had the bases loaded, but Flores made a diving stop on a groundball up the middle and flipped to Brittney Mendoza for the force at second to end the game. Garber, de Jesus and Solderitch each posted two hits in the victory, while Flores scored three times. Katie Stahre (Lake Forest) earned her third win of the year after allowing six runs in 6.2 innings of work, while Sarah Piening retired the final batter of the game to pick up her first career save.